Al-Azhar's Grand Imam Ahmed El-Tayeb paid a visit on Wednesday to the Coptic Cathedral in Cairo to offer tidings to Pope Tawadros II on the occasion of the Coptic Orthodox Christmas on 7 January. El-Tayeb was accompanied by top clergymen and youth from Al-Azhar institution, the country's highest Islamic Sunni authority. El-Tayeb congratulated the pope on the opening of the new cathedral in the New Administrative Capital, and stressed that the feelings of compassion and the exchange of visits between Muslims and Christians are in accordance with the teachings of Islam, which urge followers to communicate with their fellow countrymen. 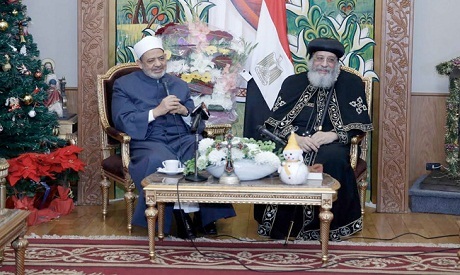 Tawadros II expressed his sincere appreciation for the visit, pointing out that mutual love and compassion between Muslims and Christians is "God's grace to the Egyptian people." The pope said that the teachings of Jesus Christ call for spreading love, joy, and peace, which the visit by Al-Azhar's Grand Imam to the Cathedral brings to the Egyptian people. Coptic Egyptians, who make up 90 percent of all Christians in the country, celebrate Christmas on 7 January. However, a minority of non-orthodox Christian Egyptians observe the holiday on 25 December.